Now is your final opportunity to experience sophisticated urban living at a value you can’t pass up! 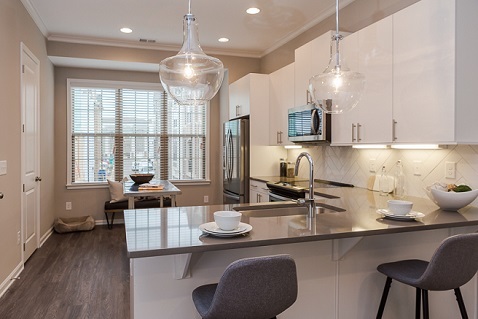 Edward Andrews Homes’ Broadview Place community is located in Buckhead’s lively Lindbergh neighborhood and features three-story townhomes priced from the high $300,000s to the mid-$400,000s. Read below to learn more about this exciting community, or watch the feature from Atlanta’s Best New Homes above! This charming, urban community features a walkable lifestyle. Enjoy greenspace within the community, walk to local amenities like the gym, grocery store, salon or even dinner, and trade your commuting time for running or biking on the planned PATH400 trail that you can access right outside your front door. Even better, try alternative commuting methods thanks to the nearby MARTA station that makes all of intown Atlanta convenient. Broadview Place’s three-story townhomes offer private garages and modern, open floor plans with access to small, semi-private yards. A spacious kitchen includes gourmet stainless steel appliances, modern cabinetry, a large pantry and tons of natural light, while the third story of the home has a private owner’s suite and second bedroom, an optimal layout for having a roommate. On the first level, the garage features additional storage, while a flex space is perfect for a home office, media room or additional bedroom. This is a rare opportunity to own here in this sophisticated community! The final few townhomes are now available. In fact, just FIVE HOMES remain! For more information, contact the community sales center by calling 678-974-0227 or visit www.EAHomes.com.